The final major portion of the Coen Brothers Blu-ray Summer, as I’ve been calling it, will cap off with two major releases celebrating the anniversary of O Brother Where Art Thou. The two releases are the first Bluray release for the film and a Deluxe 2 Disc O Brother Where Art Thou soundtrack. On August 16th the deluxe two disc soundtrack, featuring 35 tracks will be released. For those of you that aren’t aware, this soundtrack happens to been one of the most popular of all time. It won Grammys (Album of the Year and Country Album of the Year) was number one on the Billboard Charts in three categories, including soundtrack, and spawned live concerts and concert dvds, including disc and vinyl releases. The new tracks from artists like, Colin Linden, The Cox Family and John Hartford and are mixed in with the 19 tracks found on the original O Brother Where Art Thou soundtrack release. The interesting fact is that all of these “new” tracks, save one, were recorded at the time of the original recordings but for various unspecified reasons were not used in the original soundtrack release. Though a “country” favorite fans of bluegrass and old-time Americana, and even those who aren’t (like myself) have found this charming soundtrack a perfect compliment to the film. 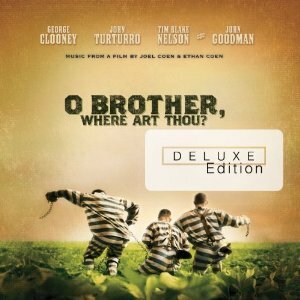 O Brother Where Art Thou Deluxe Edition Soundtrack Pre-orders are available at the bottom of the post. Following on the heels of the deluxe edition soundtrack, the O Brother Where Art Thou Blu-ray release will happen on September 13th, 2011. Most of the Coen Brothers releases are considered to be “bare bones”. The Coens do not like revisiting their old works at all as I’ve discussed in the previous articles, only showing any affection for Miller’s Crossing (and that one definitely deserves consideration) and not recording commentaries for the their more “current” films like this one and on. According to the Cinemablend website, this disc is a Disney produced release, so it will feature some extras. “Some” is a lot more than none. They list extras as being story board comparisons, a trailer, a behind the scenes featurette and video for “I am a Man of Constant Sorrow.” O Brother Where Art Thou Blu-ray Pre-order is available below. Coen fans will want to pick this up for their collection, and quality soundtrack fans will want to do the same with the music.